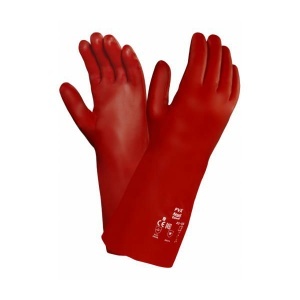 As one of only a few gloves suitable for handling strong organic solvents, the Ansell PVA 15-554 Fully Coated Red Gauntlet Gloves are ideal for providing hand protection in a wide range of industries where chemicals are present. The antistatic gauntlet gloves are comfortable to wear with an anatomical and cushioning design, allowing hands to remain protected without compromise to performance ability. The product code for the gauntlet gloves is: 15-554. When working in environments where harsh chemicals are present, hands must be protected sufficiently. The PVA 15-554 gauntlets enable safer handling of strong organic solvents, while also being virtually inert in aromatic and chlorinated solvents, enabling greater versatility of wear. In addition to quality hand protection, the 15-554 gauntlet gloves allow hands to remain comfortable without compromise to safety. The anatomical gloves feature pre-curved fingers and winged thumbs for easier manipulation. They also include a soft two-piece knitted liner that cushions the hands and absorbs perspiration, keeping hands feeling comfortable and dry while they work. For more information about permeation breakthrough times of the 15-554 gauntlet gloves, please consult the PDF below. The Ansell PVA 15-554 Gauntlet Gloves are available in a choice of sizes, making them suitable for most users. Please consult the table below for details, then select the required size from the drop-down menu at the top of the page. The gauntlet gloves have a length of 355mm.